We believe that our patients should receive a comprehensive treatment program, which includes direct hands-on, one-on-one treatment and progressive plan of care individualized to our patient’s needs and goals. Our continuing education is a combination of manual therapy techniques, functional movement assessments, strength & conditioning and other fitness related courses to help us advance our clinical skills, techniques, and clinical reasoning which serves the needs and purpose of our clientele. We also have a strong philosophy in neuromuscular rehabilitation to manage musculoskeletal pain, which is rooted in developmental kinesiology. This creates functional regional interdependence to improve the movement system. At ESPT, our education and expertise specializes in the everyday and elite athlete because we understand the drive, discipline, and competitiveness in order to train through injuries. 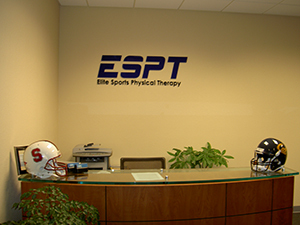 Many of our patients embody ESPT’s philosophy and culture and find that our advanced and progressive approach allows them to recover quicker. We are also extremely versatile, multi-talented and adaptable and our patients who live a gentler, quieter lifestyle also benefit from our care in order to continue to grow healthier and stronger with age. We improve people’s quality of life and movement to make it possible to continue to do the activities that they love. To become the leader in sports rehabilitation and care by providing our clients the full spectrum of services to improve physical recovery, improve sports performance and athletic development, and develop a life of health and wellness. We are committed. We choose to make every moment, every treatment, and every training session count. We master our skills and further our goals so that each day is an opportunity for our patients to feel better, move better, and live better. We are self-driven. At ESPT, we are passionate, focused and hard working people. We focus on the goals that this day or moment requires and we are driven to reach them. We are compassionate. We have a strong desire to understand our patients’ physical and emotional challenges they experience as a result of injury, pain or dysfunction. We truly care how it impacts their daily lives and strive to provide the best care. We collaborate. Team members of ESPT – front desk, aides, physical therapists, personal trainers, billing & insurance personnel – we all play a vital role in the success of our clients. From the decision to start care at ESPT, through physical rehabilitation and onwards towards post-rehabilitation and wellness, all team members work together. We are competitive. We know what our specialty is. We offer individualized and progressive physical rehabilitation, which serve the needs and goals of our patients who enjoy living a lifestyle free of pain, full of movement, and passion to do the activities that they love without dysfunction or limitations. We are constantly learning. Your ESPT experience will only be as good as the education and experience behind the team who help you. Our continuing education specializes towards a vast continuum of care including Functional Movement Screens, Graston Therapy, Active Release Techniques, TRX Suspension training, and countless orthopedic courses. The Elite Sports Physical Therapy rehabilitative and training philosophy is the fundamental belief serving as the foundation for how we operate. It has been built through personal experiences, education, and a trace of every physical therapist and patient/client who has graced our clinic. Our philosophy is ever-changing and evolving for how we manage care at any given time. In this progressive field of rehabilitation, we are not afraid to alter our philosophy as this signifies continual growth, development, and willingness to remain at the upper end of innovation in helping our patients/clients improve and maintain function and quality of life.